In sociology, it's known as the Matthew effect. What's the methodological lesson as to the sayings attributed to Jesus? There are three candidates. First, Sanders': reject them all and attend instead to narrative events. A great loss. Second, pick and choose by applying the best criteria one can contrive. The example of the Dalia Lama's saying suggests this method sustains excessive credulity. Finally, there's Allison's way. If the saying is a part of a theme, a repeated motif (sorry rich guys, last shall be first, be forgiving, I set my face towards Jerusalem), then it's probably as well tested as may be hoped, and should be credited. Which implies that any particular saying, even the loveliest, still falls to Sanderian skepticism. What about the misattribution of a quote to Lycurgus? Or Hercules? I was pleased to learn that there is a name for what I have described twice in my blog this week. Thank you to Stephen Carlson for his comment which revealed to me the existance of the Matthew Effect. Thanks also to NTBlogzone for giving my story a few more legs. As silly as my blog can be, I often go on after serious issues - and this was one. It's usually when somebody or something annoys me enough that I will take the time to look deeper. It occurs to me that if the spurious quote is eventually adopted by DL supporters as authentic, and Damien's deconstruction is preserved in the future, it will likely not be recognizable. Something like "The enemies did not acknowledge his words." Meant to say "enemies of the Dalai Lama". We see passages that refer to the enemies of Jesus in the NT and fathers... My guess is that this included people in any way critical of the movement. I agree, Tony. These things stick because they are so plausible. James -- I have some sympathy with the way that you describe things. It should perhaps be added that Sanders does not reject all the sayings, though. In fact, he spends a lot of time on sayings like the divorce sayings in the Synoptics and Paul. Thanks, Damien. I really enjoyed your post. I mentioned it in class this morning too. still one of my top 5 most visited blog posts. people LOVE a good quote when it is attributed to someone they want to admire. and THAT is how you got the sayings of the biblical jesus. Excellent! Thanks, Bob. Your post from as recently as May also illustrates something troubling about blogging -- our horribly short memories. Now I look at that (fine) post again, I think, "Ah yes! I remember reading that!" But it did not occur to me while writing this post. Mind you, it's also one of the great things about blogs that the stronger, more interesting posts like that will generate more comments and links and so guarantee longevity. We seem to be missing an important point here. If we were to reconstruct the thought of the Dalai Lama from this quotation, we would not be doing too badly. Similarly the MLK quote does reflect his thought well, even if not all the words were his. These two mis-attributed quotations went viral only because they reflected the distinctive legacies of MLK and the Dalai Lama. Indeed, I suspect you would need to live with these two individuals for days or weeks before you heard words that summed up their distinctive thought better than these mis-quotations. Also, let's not extrapolate too much from a few cases of mis-quotation. What about all the accurately attributed quotations that are out there? Thanks for sharing this Mark! I posted a reflection on this and your follow up post, linking to them both. I'm a big fan of the Dalai Lama and something about this quote just strike me as OFF. Thanks for clearing up my gut feeling that it's a hoax. "The Dalai Lama, when asked..."
There've been lots of Dalai Lamas...it will be hard to prove none of them ever said it. Just like there are lots of Pauls and it will be hard to prove none of them ever wrote some interpolation in Romans. Stephen C. Carlson, could you clarify why you are calling this the Matthew effect? A google search says that has more to do with "the rich get richer and the poor get poorer." being a follower of H.H. 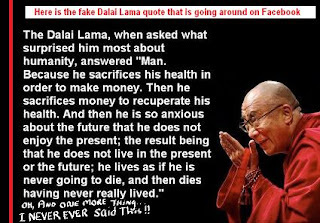 The Dalai Lama, i have always heard him saying the same thing in every major Speeches. He has always taught us not to run after money like a fool, he has always told us to fear death and be wise and compassionate. i have always heard him saying those lines, but in Tibetan. Now its the art of those writers to present his speeches to whatever PHEW or Beau. James J. Blanchard created the original, later "adapted" statement in a short story never published. Many thanks, Robert. That's fascinating. I should update this post with a link to your post. There is a phrase that is about in the outlaw bike community " everyone dies only a few live" much more simplified version of the above quote. It is certainly revealing to witness how a fake quotation can be so easily invented and attributed to a well-known personality such as the Dalai Lama in our age of powerful means of archiving and distributing documents, and checking on authenticity of attributions. Which of course, inspires us to believe that such inventions and attributions of sayings must have been infinitely easier to fabricate in Antiquity when archiving was rudimentary, the distribution of original documents ridiculously limited, and means of fact checking by any curious scholar non-existant. This example tends to support the hypothesis of many historians that the quotations ascribed to Jesus in the four Gospels (and the many non-canonical gospels too) could easily have been spurious attributions to a speaker named Jesus who may never have pronounced the words, but is used as an anchor for assembling a suite of pithy sayings that are striking and interesting. And once such doubts have been launched (David Strauss), a natural expansion of such skepticism may have spontaneously led to the radical thesis that the speaker named Jesus may too have been a literary invention to provide a support for a collection of interesting sayings assembled by writers (Bruno Bauer, Edwin Johnson), as Albert Schweitzer shows in Ch. XI of his "Quest" (1906/13). In exactly the same manner that all the sayings collected in Proverbs have been attributed to the figure of Wisdom (Sophia), who reappears in many books of the Hebrew Testament as the anchor for similar wisdom sayings. "...You can spend all your time making money. You can spend all your love making time...."